There are twenty-five shopping days left until Christmas. 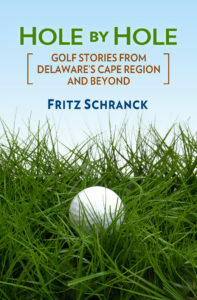 Here are some suggestions for Cape Region golfers, or those looking to buy gifts for their favorite duffers. Shawnee Country Club is holding its members’ annual Christmas party beginning at 7 p.m. tonight, and the pro shop will be open. The evening’s festivities include a special holiday sale, in which buyers pop a balloon to see how much of a discount will be taken off the items they selected. The shop will remain open during December from 8 a.m. to 5 p.m. daily, and Christmas sales prices will remain in effect (422-7010*). Rob Marshall of Old Landing Golf Course (227-3131) is selling golf balls and gift certificates for tee times at the area’s oldest public golf course. His shop is open daily from 9 a.m. to 4:30 p.m.
Chuck Harmon said that Kings Creek Country Club scheduled its annual Christmas sale for December 8. Light adult refreshments and hors d’oeuvres will be served from 4 p.m. to 8 p.m. In addition to the club’s traditional balloon sale, the shop staff will also gift-wrap the goodies they sell that night. If you miss the action on the 8th, they’ll be open normally from 8 a.m. to 5 p.m. (227-8953). Bethany Bay Golf Course, the Bethany area executive course (539-3833), is selling gift certificates for tee times. They’re open from 9 a.m. to 4 p.m. daily. At The Rookery, head golf professional Butch Holtzclaw is putting his summer stock items out on deep discount. Women’s clothing is 40% off, and men’s items are reduced by 20%. They’ve also knocked 25% off their golf shoe prices. The shop’s merchandise includes many logo items, and their gift certificates are also good for lessons, tee times, and merchandise. Their shop is open from 8 a.m. to 5 p.m. daily (684-3000). Ed Larkin and his staff at Clubhouse Golf, just outside Rehoboth Beach, are busy with holiday sales for Cape Region locals and the hordes of wintertime shopping tourists. Nearly everything in the store is marked down, with special prices on Adams drivers and irons, ladies’ Footjoy shoes, and all men’s and women’s clothing. Boyd Russell said to stop by anytime, with store hours from 9 a.m. to 6 p.m. Monday through Thursday, 9 a.m. to 8 p.m. Friday and Saturday, and 10 a.m. to 6 p.m. on Sunday (227-3347). Jo Jo Barrows, who helps run the pro shop at Rehoboth Beach Country Club with her husband, head professional Ron Barrows, said they’re offering special close-out prices on selected golf balls, such as Taylor Made’s Innergel line. They will also take 20% off any clubs in stock. The pro shop opens daily at 9 a.m., and will appeal to golfers with an equipment fetish and a dollar or two (227-3616). At Bear Trap Dunes near Ocean View (537-5600), Jody Martin said they have a large selection of items for sale at 50% off. The pro shop is open from 9 a.m. to 5 p.m., and gift certificates for merchandise and tee times are also available. Brian Barrows, the golf professional at Baywood Greens, the Long Neck area public course, is happy to accommodate Cape Region golfers looking for bargains. Their shop is open from 9 a.m. to 5 p.m. daily, and they’ll gladly sell gift certificates for tee times throughout the year (947-9800). Don’t forget to also check out the available items at the other Cape Region golf shops, including Angola’s Marsh Island Golf Course (945-4653), Heritage Inn & Golf near Midway (644-3860), and Georgetown’s Sussex Pines Country Club (856-3363). With all these options, there should be no problem finding a great gift. *All telephone numbers use Area Code 302.